The Blue Jacket franchise has advanced from the First Round now in both Ultimate NHL Playoffs. The 36th-seeded ’13-’14 Jackets upset the 29th-seeded ’11-’12 Phoenix Coyotes in a tight six-game series that starred some great goaltending. Offense was hard to come by for both teams, but for Phoenix it was Ray Whitney and Radim Vrbata who led them in goal scoring with three apiece. Longtime captain Shane Doan finished second with two. Outside of those three, only five other players scored for the Yotes. Whitney and Vrbata were also tied for the lead in assists with defenseman Rostislav Klesla with three while five players were tied for second with two, including Doan. This of course means that Whitney and Vrbata led the Yotes in overall scoring with six points each and Doan was second with four. Whitney also posted a +2 plus/minus rating which was tied for the team lead, along with defenseman Chris Summers, who only appeared in two games. Four players were tied for second at +1, including Vrbata and Klesla. As stated in the first period, goaltending was stellar in this series and Mike Smith was phenomenal for Phoenix. He posted a 2-2-2 record with a 2.33 goals against average and a .936 save percentage. He also posted a 29-save shutout in Game 2. The Jackets had some unlikely heroes in the series and those included Artem Anisimov and Cam Atkinson, who were tied for the team lead in goals with three. 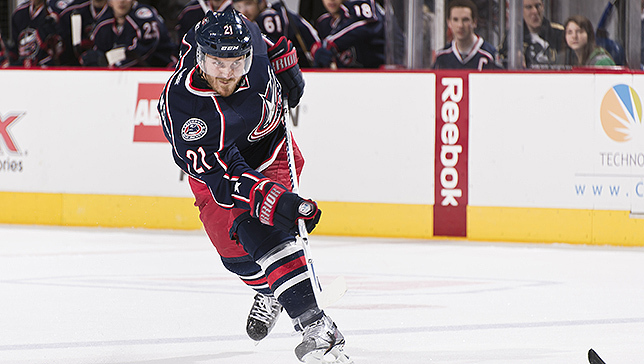 Defenseman and Game 6 hero, James Wisniewski, was tied for second in goals with Nick Foligno at two. Ryan Johansen co-lead Columbus in assists with four with Wiz, who stood alone atop the overall scoring leaders with six points. Foligno and Anisimov were tied for second behind Wisniewski with five points each. At a +4, it was R.J. Umberger who led the Jackets in plus/minus and behind him in second was Foligno and Marian Gaborik, yeah, I know, at +3. All that being said, it was BOB who was the star for Columbus. Sergei Bobrovsky had an incredible series. He finished with a 4-2-0 record with a 2.17 goals against average and a .940 save percentage. He posted 40+ saves twice during the six-game series. So, the 36th-seeded ’13-’14 Columbus Blue Jackets move on from the First Round and will face off against a reigning Semifinalist in the 4th-seeded ’73-’74 Boston Bruins. Meanwhile, the ’11-’12 Phoenix Coyotes have lost in six games in the First Round of both UNP tournaments. Up next in the First Round is a matchup between the 32-seeded ’37-’38 New York Americans and the 33rd-seeded ’06-’07 Nashville Predators! This entry was posted in 1st Round, Ultimate NHL Playoff and tagged Artem Anisimov, Cam Atkinson, Chris Summers, Columbus Blue Jackets, First Round, James Wisniewski, Marian Gaborik, Mike Smith, Nick Foligno, Phoenix Coyotes, R.J. Umberger, Radim Vrbata, Ray Whitney, Rostislav Klesla, Ryan Johansen, Sergei Bobrovsky, Shane Doan, Ultimate NHL Playoff. Bookmark the permalink.